Over the past couple of months, more than one legal commentator has painted the new(ish) secretary of state for justice, Michael Gove, as a bit of a good thing. Admittedly, Attila the Hun would have seemed a breath of fresh air after the not exactly cerebral Chris Grayling. But, since his appointment in May, Gove has won plaudits for swiftly reversing the ludicrous prison book ‘ban’, for highlighting the need to modernise our ridiculously antiquated court procedures, and for hinting he may be something of a penal reformer. Even I have found myself in solidarity with him on decriminalisation of TV licence fee evasion. So far, however, I have not been tempted to join the emergent Michael Gove Fan Club. Because Gove’s few comments to date on employment tribunal fees, and their devastating impact on workers’ access to justice, suggest his approach to the issue is no more intelligent than that of his predecessor. I think that I’d have to see whether or not there was an example of people – or an individual – who’d been dismissed, who hadn’t had appropriate access to justice as a result, and that hard case – or those hard cases – would lead me to think again. But at the moment, what I think is likely to have been the case, is that the bar has been set at a high level, absolutely, but there is no evidence yet that the bar being set at a high level has meant that meritorious claims by people who feel [sic] they’ve been discriminated against aren’t being heard. But it’s the final part of Gove’s comment that gives away the real intellectual incoherence of his position. For there is in fact no shortage of evidence of people who feel that they’ve been discriminated against (or otherwise unlawfully treated) by an employer, but who say they have been deterred from seeking justice through the tribunal system by the fees. As long ago as July 2014, Citizens Advice published an analysis of 182 potential tribunal claims dealt with by its local offices (formerly known as Citizens Advice Bureaux), showing that 34 potential claimants assessed by their employment law advisers as having a better than even chance of success in the tribunal were put off from pursuing a claim by the fees. ‘Denise’, employed on a zero-hours contract, had had her regular working hours substantially cut since she had taken time off for a pregnancy-related illness. When she had challenged her employer, pointing out that several new staff had been taken on recently, she was told “we need people we can rely on”. The helpline team advised Denise that her treatment amounted to pregnancy discrimination, but Denise said there was no way she could afford to pay the fees of up to £1,200 to pursue a tribunal claim. Maybe Gove himself has never seen such examples of apparent ‘rough justice’. But we know his Ministry officials and legal counsel have, and we know their response. The 34 Citizens Advice cases they dismissed out of hand, stating – in October 2014, in their detailed grounds of defence of UNISON’s application for judicial review in the High Court – that “the methodology of the study is such that one cannot be confident of its reliability”, and that “whilst the advisers doubtless make a conscientious assessment of the likely prospects of success for their clients, the fact is that, ultimately, the advisers’ assessment is not the most objective one as they have only heard their client’s viewpoint, without the input of the defending employer.” And no doubt they would say the same of the Working Families helpline advisers, and their clients ‘Martha’ and ‘Denise’. And the fact is, the Ministry mandarins are right. Because, as noted just last month by no less an authority than the Department for Business, Innovation & Skills, “only an employment tribunal can determine whether unlawful discrimination or unfair dismissal has occurred”. And, by definition, the potential but ‘deterred by fees’ claims of ‘Martha’, ‘Denise’, the 34 Citizens Advice clients, and any number of others whose cases have been highlighted over the past two years will never go near an employment tribunal. So, dozens, hundreds or even thousands of examples of apparent ‘rough justice’ could be put before the justice secretary, but he will always be able to say, in each and every case, ‘but we don’t know that the claim is meritorious, as we haven’t heard the employer’s side of the story’. So he will never have to accept that there has been even one case of genuine ‘rough justice’, and he will never be placed in a position where he has to “think again” about fees. In short, the evidential bar for the Ministry’s post-implementation review of the fees has been set impossibly high, and not even an Olympian case study-gathering effort by critics such as myself (and an awful lot of employment lawyers) would make any difference to the ideology-driven outcome. And of course, unless Gove is a lot less cerebral than his reputation suggests, he must realise this himself. Which means his response to the justice select committee in July was not just intellectually incoherent. It was grubbily dishonest. One in 10 #ukemplaw statistics are rubbish. Or is it six in 10? I’ve written here more than once before about the seemingly growing practice by law firms and others of using eye-catching statistics based on ‘quick and dirty’, dubious or even non-existent research to grab a few headlines for their organisation. All too many journalists – in both mainstream media and the specialist press – seem to lack a critical eye, and to simply regurgitate ostensibly ‘shocking’ statistics without question or analysis. And this week has been a bumper week, with no fewer than four questionable research ‘findings’ on different aspects of the labour market making headlines. On Wednesday, the BBC, Guardian, Independent, Daily Mail and others reported that 58.8 per cent of UK university graduates are working in jobs that do not require a degree, according to research commissioned by the Chartered Institute of Personnel & Development (CIPD). This startling figure was the lead news story on BBC Radio 4’s flagship Today programme, though it appears no one at the BBC thought to query the spurious precision – are the good people at CIPD quite sure it’s not 58.7 per cent? – or to ask how many UK university graduates had actually been surveyed for the research, and when. The 29-page CIPD report is wordy and no doubt worthy, and there’s no question as to its academic credentials. But you have to dig quite hard to discover that the 58.8 per cent figure is based on data from just one question in a 2010 European Social Survey, namely: “how many years of education someone would need to be hired for their current job”. To arrive at the 58.8 per cent figure, the CIPD researchers then assume “15–16 years of education as the minimum indicator for a graduate job”. That is, they were probably a graduate. But hey, let’s stick 58.8 per cent in the press release and see how it goes. Bingo! Later the same day, the Daily Telegraph reported that, according to new research by Citizens Advice, 460,000 workers – one in 10 of the 4.6 million self-employed in the UK labour force – are cheated out of holiday pay, sick leave and pensions because “businesses have wrongly hired them as self-employed”. For its 22-page report, Citizens Advice surveyed a total of 491 of its clients, through two separate surveys (one online), and then determined from their answers that one in 10 “are on ‘bogus’ [self-employment] contracts, and should rightfully be appointed as company staff”. 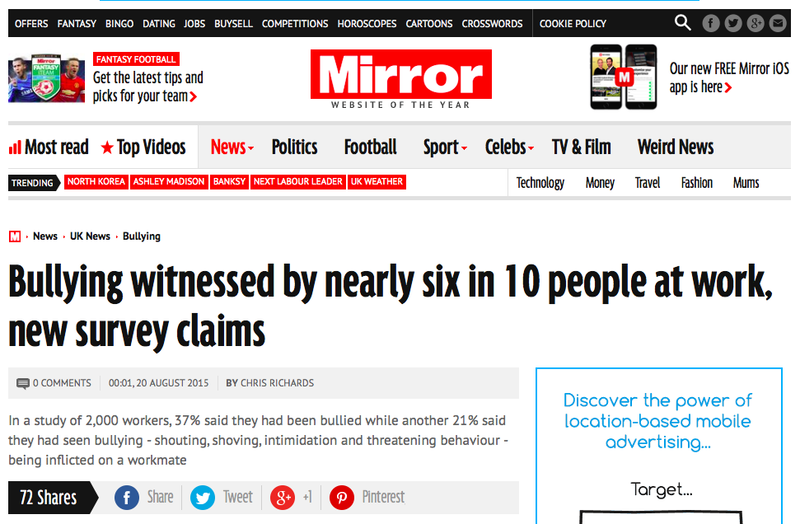 (Based on my 13 years at Citizens Advice, I’m surprised it’s only one in 10, but that’s another matter). Then, on the basis that the “scale” of these 491 responses “provides a statistically-valid representation of the UK self-employment market (at a 95% confidence level, with a plus or minus 4% margin of error)”, despite the respondents to the online survey having self-selected, the Citizen Advice wonks extrapolate their ‘one in 10’ to the 4.6 million self-employed, do a few quick sums to show how much that is costing HM Treasury in lost National Insurance payments (£314m a year), and – Bob’s your uncle! – they have a headline in the Daily Telegraph and a piece on BBC TV’s supposedly cerebral Newsnight (at 20m15). Except that, as any fule kno, and as – somewhat bizarrely – the very next sentence in the report acknowledges, Citizens Advice clients are not representative of the national labour force. On average, they are lower paid, lower skilled, work fewer hours, and – crucially – are far more likely to be working for an unscrupulous or ‘rogue’ employer. Furthermore, as already noted above, the online survey collected data from self-selecting respondents (the ‘methodology’ section of the report doesn’t even break down the number of respondents for each of the two surveys). Fortunately, not all journalists are as unquestioning as those at the Telegraph or Newsnight, so (for example) there is no mention of Citizens Advice’s ‘bogus’ 460,000 figure in the FT’s coverage of the report. Come today, and the Independent reports that “zero-hours contracts make up one in four offers to [the] jobless”, according to research by recruitment website Glassdoor UK. However, a quick glance at Glassdoor’s own press release reveals that the ‘research’ says no such thing. According to that press release, 23 per cent of the 1,001 “unemployed people” surveyed online by market researchers Opinion Matters for Glassdoor in May reported having been “offered a zero-hours contract”. Which begs the obvious question: when, and how many times, were they offered such a contract? The press release doesn’t say, and there is no link to any actual report that might explain the research methodology, so I contacted Glassdoor. They replied with a generic statement from Opinion Matters on how they ‘recruit’ such respondents: essentially, respondents are remunerated for being part of a panel that completes any number of surveys emailed to them by Opinion Matters. So we have no way of knowing whether, and if so how, the 1,001 respondents are representative of ‘unemployed people’, even if we can agree on a definition of ‘unemployed’ (e.g. unemployed and seeking work). Glassdoor also sent me a spreadsheet containing the survey data. This shows that the question asked was simply: “Have you ever [sic] been offered a zero-hours contract”. 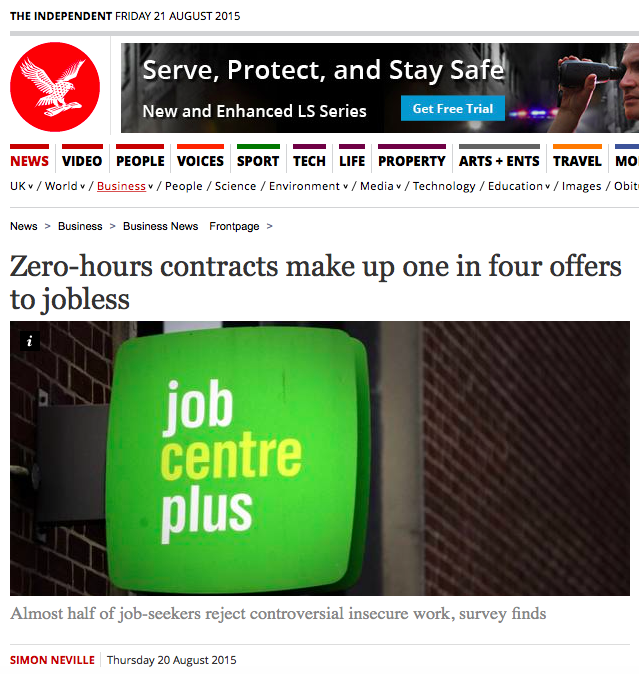 So, the ‘finding’ that 77 per of the 1,001 respondents have never been offered a zero-hours contract – despite 299 (one in three) having been ‘unemployed’ for longer than three years, and 38 for more than a decade – tells us nothing at all about the proportion of job offers made to ‘the jobless’ in 2015 that are zero-hours contracts. We used an online quantitative methodology to achieve the overall 2,000 sample base of UK workers. In terms of this sample being robust enough to represent the UK workforce, based on the latest employment data from the ONS, there is a total of 31 million workers across the UK. With this in mind, a sample size of 2,000 is considered to be robust and representative (working to a low margin of error of 2.2% and a confidence level of 95%). In short, Citizens Advice, Opinion Matters and Censuswide all appear to have worked on the highly questionable assumption that sample size alone is sufficient to ensure that their survey findings are representative of – so can be extrapolated to – the whole labour force. Which perhaps goes some way to explaining why the pollsters got it so wrong in May. For we know that, even if Citizens Advice surveyed all 30,000 of the self-employed people it advises through its “local offices” each year – Citizens Advice Bureaux seem to be a thing of the past, thanks to a recent brand makeover – the findings could still not be extrapolated to the national labour force. And how do we know that there isn’t a correlation between becoming a remunerated Censuswide panel member and having been bullied at work in the past, or between being ‘unemployed’ and becoming a remunerated Opinion Matters panel member? Which is not to say that there are such correlations. We don’t know one way or the other. But if researchers don’t publish and explain the methodology used for their ‘research’, they must expect at least some people to question their headline-grabbing findings. And, perhaps more importantly, to question what they have added to the debate on labour market issues and appropriate policy responses. On 24 July, as I was busy lying on a beach in Portugal, the Department for Business Innovation & Skills (BIS) and the Equality & Human Rights Commission (ECHR) published the first findings of their joint, £1 million research study into pregnancy and maternity discrimination at work. Though you could be forgiven for not realising, from the associated press and media coverage, that the study was very much a joint enterprise between BIS and the EHRC. For the current crop of ministers exhibited no desire to associate themselves with the outcome of an initiative announced with some fanfare by their Conservative colleague and then minister for women and equalities, Maria Miller, in October 2013. Mrs Miller – now chair of the newly-formed women and equalities select committee – did at least manage to tweet a call for ministers to “act to stop employers flouting [the] law protecting pregnant women”. And former BIS minister Jo Swinson – seemingly the driving force behind the 2013 decision to commission the research – went further, describing the findings as “sobering” and using a blog for Mumsnet to call for “a zero tolerance approach to [such] discrimination”. But from prime minister David Cameron, current minister for women and equalities Nicky Morgan, justice secretary Michael Gove, and BIS ministers such as Sajid Javid and Nick Boles, there was not a peep. Only one in 12 (8%) of those women who raise a concern about their treatment at work obtain legal advice from an external advice provider such as Maternity Action or a CAB. You’d think ministers first elected (in 2010) on a manifesto promising to make Britain “the most family-friendly country in Europe” and positioning themselves as the ‘true party of workers’ might have something to say about such authoritative research findings. However, as Ros Bragg of Maternity Action noted in the Guardian, they might then have to explain not only why they’ve done nothing to address what amounts to a significant deterioration in the position of pregnant women and new mothers in the workplace over the past decade, but also why they have acted to make it far more difficult for women to challenge their employer and obtain justice. In particular, they might have to explain why, since July 2013, women wishing to pursue a tribunal claim for pregnancy, maternity or other discrimination have had to pay up to £1,200 in upfront tribunal fees. 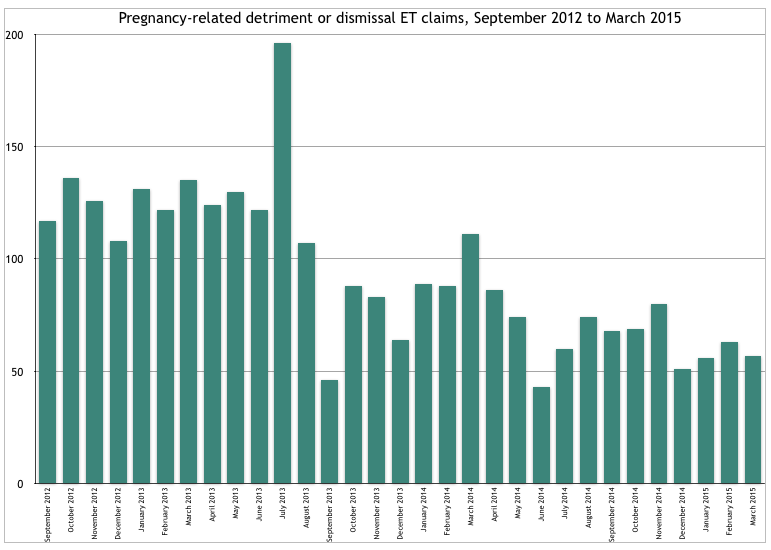 Pursuing a tribunal claim has always been a daunting prospect, especially for pregnant women and new mothers, and – as the following chart shows – the number of claims for pregnancy-related detriment or dismissal has never been huge. But the number of such claims has fallen by 40%, from an average of 126 per month before fees, to just 75 per month in 2014. That government ministers should have nothing at all to say about this is troubling enough. But Cameron, Morgan, Gove and Javid were hardly put to shame by their ministerial shadows. Labour’s press office did put out a brief statement by shadow equalities minister Gloria De Piero – “It’s time to look at how we can strengthen the law and scrap tribunal fees so cost is never a barrier to justice” – but otherwise the silence from Labour MPs, including the four leadership candidates, was almost as deafening as that from government ministers. As far as I can tell, neither Yvette Cooper nor Liz Kendall considered the issue worthy of their comment, despite their (laudable) record of highlighting such discrimination, and the pink bus stayed locked away in its garage. Such reticence from the party that Liz Kendall describes – in a campaigning piece issued just five days after the launch of the BIS/EHRC research – as “the greatest champion of equality and opportunity that our country has ever known” is mystifying and, it must be said, deeply depressing. It may well be time, in the words of Maternity Action’s Ros Bragg, for ministers to “move beyond family-friendly rhetoric to delivering practical solutions to this persistent and growing problem”, but shadow ministers have yet to deliver any credible rhetoric. It’s not as if the issue is that complex – tens of thousands of women are being forced out of work simply for having babies. And if the Labour opposition really has nothing to say about that, then it’s no surprise that government ministers feel able to sit on their hands too.